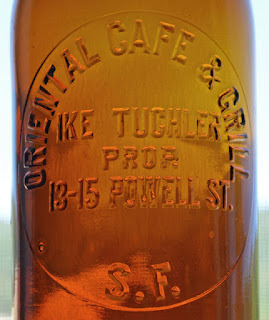 When I was about 15, a member of the Central Oregon Bottle and Relic Club brought is a medicine bottle for "show and tell". It was a crude amber square pint with tremendous crudity and bubbles. It was a Gun Wa's Chinese Remedy, Warranted Entirely Vegetable and Harmless. He stated that this was a female remedy from Denver, Colorado and that it was very rare. I have always liked the name and the character of these medicines, and years later, I was able to add one to my collection. In the decades since, I have always read or been told that the Gun Wa was indeed a female remedy and I have seen some beautiful examples ranging from amber to yellow with strong green tone. They always have applied tops and are very crudely made. I have also seen two larger variants which resemble a typical bitters square. The 8" size is more prevalent but are still considered to be rare with about 25-30 examples known, many with some form of damage. 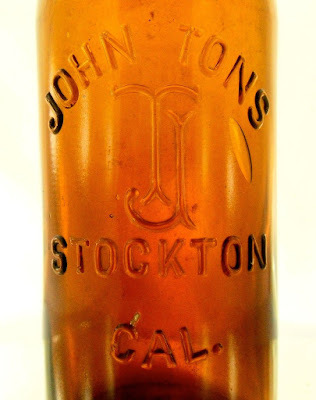 Recently I acquired a collection of mostly gold rush California bottles with the occasional odd ball piece from the rest of the US. Included with the collection was a large envelope of notes, ads, labels, and patents. I was surprised to find this ad for the Gun Wa, and even more surprised to see it was not a female remedy, but a cure for lost manhood! The ad also claims that Gun Wa was a physician in China who came to the US but was banned from practicing medicine. He was however, permitted to provide his remedy to the public for a small sum of money. His remedy cured the results of youthful folly...whatever that means, and made weak men strong. I guess this was an early version of Viagra. The bottles are quite crude and appear early, but this brand was sold in the late 1880s, I believe in Denver. I assume the bottles were blown locally and not in San Francisco, and it would appear that the glass house was not up on the latest technology for the day. I also believe that the vast majority of these have been dug in the Denver area but I would be very interested to know if any have been found elsewhere. 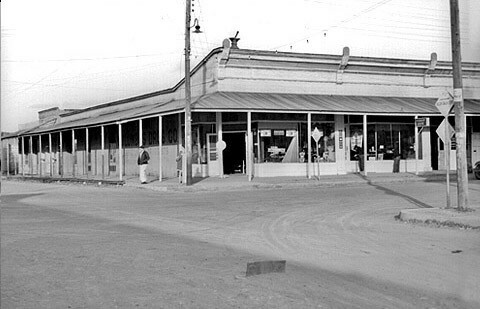 Very interesting and informative post over at Bruce Silva's Western Whiskey Gazette. 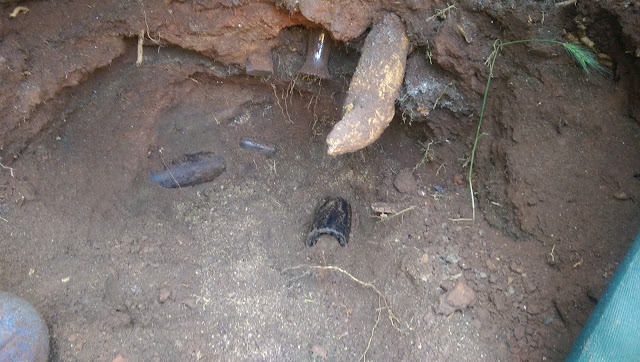 Here are a couple very interesting artifacts from a recently dug 1870-80 pit. While some nice glass was recovered, I dug these two pieces right next to each other. I recognized the pistol, but at first the wrought iron monster treble hook was a mystery...to heavy, and large for any fish...too small to repel down a building like Batman. I believe it is an attempt at an Outhouse recovery system. We have all been amazed at what is found in early privies, and the thought of " It fell in, so there it will stay". Well, what happens if you accidentally drop your prized revolver in to the slop? Pretty difficult to retrieve, UNLESS you have this handy dandy recovery grappling hook to lower down and recover your pistol or whatever it might hook on to. Pretty ingenious but alas, the pistol was laying next to said hook, and apparently did not prove successful. Of course it could just be a "honey bucket" hook used by the Chinese to clean to pit, although the hole was jammed with age correct glass and trash for this residence. Has anyone else found one of these? It is a first for me! DM. 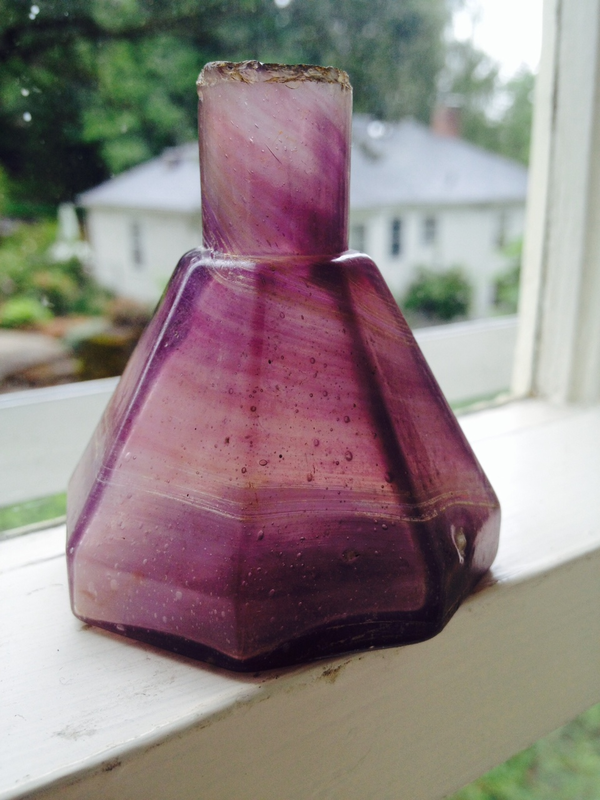 Thanks for posting the Wieland’s bottle - mystery solved! I have another question for your readers. I have a several pint bowling shaped milk bottles embossed "HENDY MACHINE WORKS PAT. AUG.13 01" on the base. I also have the same shaped bottles embossed “EMPIRE PAT.AUG.13 01” on the base. I have not been able to find any information about the glass manufacturing operation of the Hendy machine works. 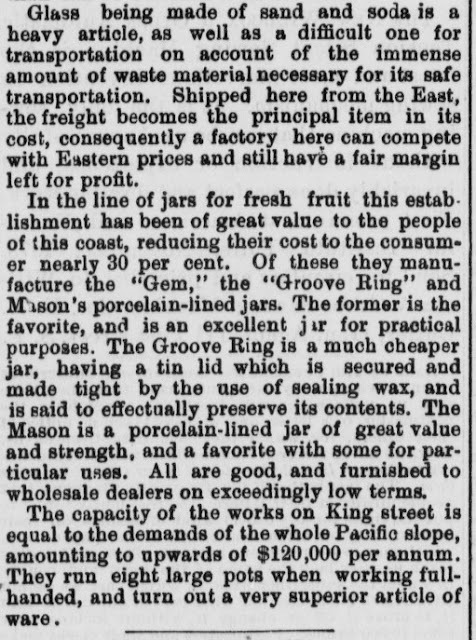 I’m guessing it was extremely short lived and they only produced bottles shortly before the earthquake and fire of 1906 that destroyed their entire business. 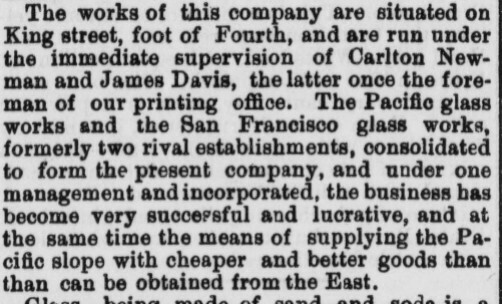 The company relocated to Sunnyvale after the earthquake and apparently did not rebuild a glass works. 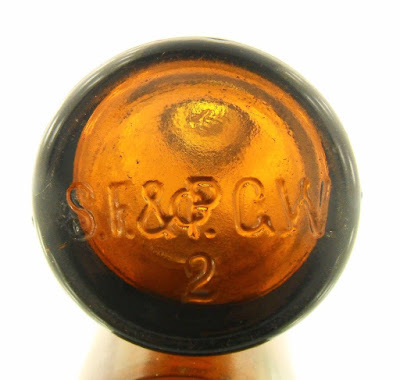 The bottles were made by an Owen’s automatic bottle making machine and the patent date may refer to that or the shape of the bottle. I’m guessing these bottles are pre earthquake. Are there bottles, other than milks, with "HENDY MACHINE WORKS” embossed on them? I was wondering if this is something you would like to post. It is a pint, mold blown beer embossed PC 77 and it has a pontil mark on the base! The inside of the lip does not have the indentation that accepted the Baltimore loop seal and there is one air vent on the side. It's obviously a fake and I am wondering if any of your readers have any information about this bottle? The John Tons Stockton beer is just one of the dozens of embossed bottles that were produced by S.F. & P.G.W. 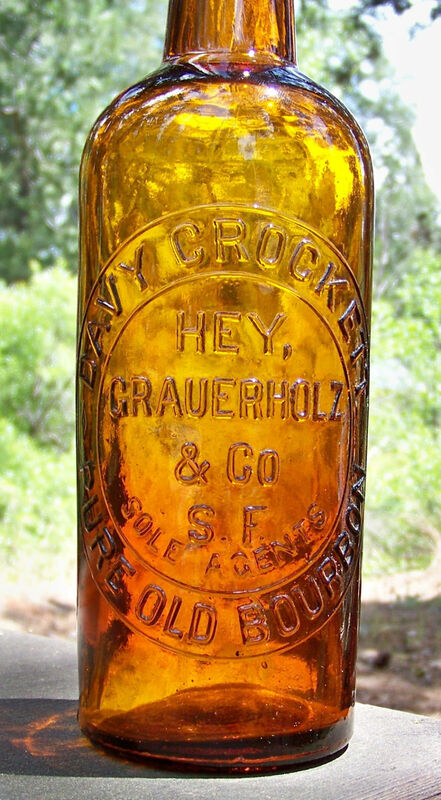 Bottles from the San Francisco and Pacific Glass Works are a interesting and historically significant category for the western collector to consider and they are usually within the average collectors price range. David "Davy" Stern Crockett (August 17, 1786 – March 6, 1836) was a 19th-century American folk hero, frontiersman, soldier, and politician. He is commonly referred to in popular culture by the epithet "King of the Wild Frontier". He represented Tennessee in the U.S. House of Representatives, served in the Texas Revolution, and died at the Battle of the Alamo. Crockett grew up in East Tennessee, where he gained a reputation for hunting and storytelling. After being made a colonel in the militia of Lawrence County, Tennessee, he was elected to the Tennessee state legislature in 1821. 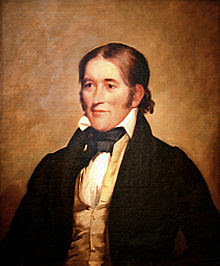 In 1825, Crockett was elected to the U.S. Congress, where he vehemently opposed many of the policies of President Andrew Jackson, most notably the Indian Removal Act. Crockett's opposition to Jackson's policies led to his defeat in the 1831 elections. He won again in 1833, then narrowly lost in 1835, prompting his angry departure to Texas (then the Mexican state of Tejas) shortly thereafter. In early 1836, Crockett took part in the Texas Revolution and was killed at the Battle of the Alamo in March. What a fantastic name for a brand of bourbon. Back in the day anyone that could relate to this rugged frontiersman and statesman would most likely jump at the chance to try a taste of good ol' Davy's whiskey. Five Glop Top Whiskies.....Unembossed of Course! My Biggest "Crier" For 2015...So Far. Here is a recent find...Hammered with whittle effect...Super bold embossing, and very clean. One problem...OUCH! No base to be found anywhere. Ready to call MH. Any more "close but no cigar" finds lately? Here is Chris Cumberland, Dominic Dwyer & Dakona Dwyer digging in Oroville, Ca. 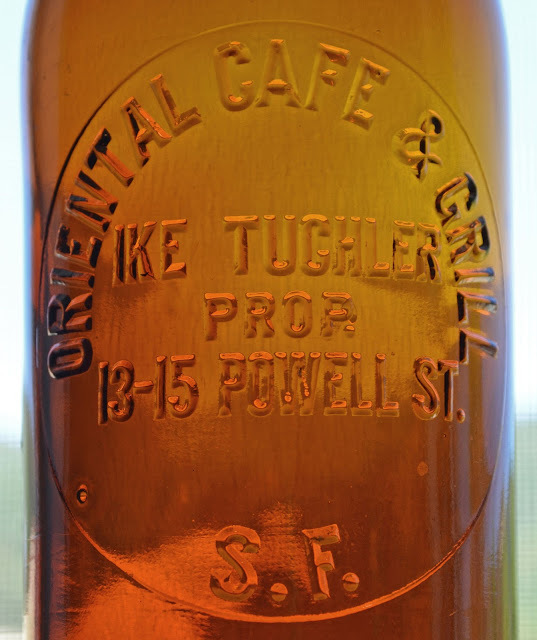 We hit several spots containing some nice local Oroville embossed bottles. 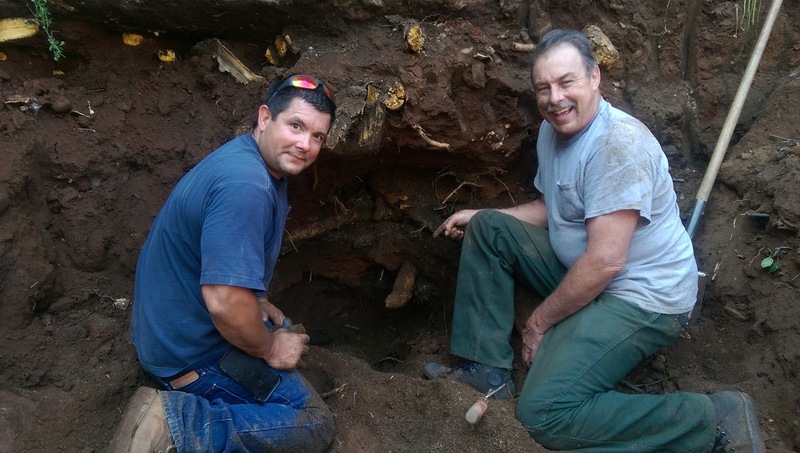 Thanks Don for sending the picture and information on the dig.